Starting January 2015 the EPEC Curriculum will be used and implemented! Aligned to the National Standards for Physical Education. EPEC is used to strengthen both the practice and the perception of physical education in schools. Schools across the country have been using EPEC for years now, and many are seeing dramatic positive results! 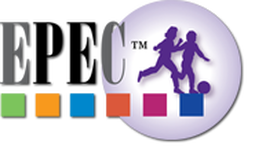 As Physical Educators to our elementary level students our goal is to help children find a variety of ways to enjoy being physically active so that they will be able to get all of the physical, emotional, intellectual and social benefits that come to someone who is physically active. 1.) Movement concepts: a variety of ways we travel (e.g. running, skipping, hopping), changes of directions and speeds, and different ways to balance, jump and land. 3.) Wellness concepts: healthy and unhealthy foods, safety and ways to improve cardiovascular endurance and flexibility. As teachers we recognize that children are at different developmental levels, with a variety of needs and interests. For this reason in every class we attempt to provide all of the children with teaming experiences that are both beneficial and enjoyable. Each lesson is also adjusted to take into account the wide range of skill and fitness levels that characterizes children in elementary school.